Guangdong outgunned Jiangsu in Game 1 of the series. Guandong Tigers dominated down low during the game scoring 80 of its points in the paint compared to Jiangsu Dragons' 44. They outrebounded Jiangsu Dragons 53-36 including a 39-27 advantage in defensive rebounds. Guandong Tigers looked well-organized offensively handing out 32 assists comparing to just 16 passes made by Jiangsu Dragons' players. American swingman MarShon Brooks (196-89, college: Providence) fired a double-double by scoring 27 points, 11 rebounds and 9 assists for the winners. His fellow American import swingman Sonny Weems (198-86, college: Arkansas) chipped in 25 points, 6 rebounds and 7 assists. American guard Donald Sloan (190-88, college: Texas A&M) produced 31 points, 6 rebounds and 6 assists and Serbian center Miroslav Raduljica (213-88) added 30 points and 10 rebounds respectively for lost side. Five Guandong Tigers and four Jiangsu Dragons players scored in double figures. The winner was already known earlier in the game, so both coaches allowed to play the bench players saving starting five for next games. Beijing overcame Shenzhen in the opener. Beijing Ducks shot the lights out from three sinking 21 long-distance shots on high 52.5 percentage. They looked well-organized offensively handing out 25 assists. International guard Shuo Fang (188-90) stepped up and scored 24 points, 6 rebounds and 6 assists for the winners and Croatian-American center Justin Hamilton (213-90, college: LSU) chipped in 22 points and 11 rebounds. At the losing side the former international forward QuAn Gu (202-92) responded with 14 points, 6 rebounds and 4 assists and American point guard Kenny Boynton (188-91, college: Florida, agency: Higher Vision Sports) scored 16 points. Five Leopards players scored in double figures. Both coaches used bench players which allowed the starters a little rest for the next games. Liaoning topped Fujian to surge ahead in the series. Flying Leopards dominated down low during the game scoring 78 of its points in the paint compared to Sturgeons' 56. Flying Leopards forced 19 Sturgeons turnovers. Their players were unselfish on offense dishing 24 assists. Sturgeons were plagued by 27 personal fouls down the stretch. The former international Ailun Guo (192-93) nailed a double-double by scoring 46 points (!!! ), 12 rebounds, 5 assists and 5 steals for the winning side and American Lester Hudson (190-84, college: Tenn-Martin) accounted for 33 points (!!! 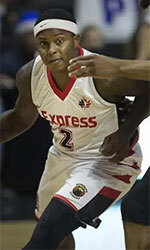 ), 10 rebounds and 8 assists. International Zhelin Wang (214-94) came up with a double-double by scoring 31 points, 23 rebounds and 5 assists and American-Ukrainian point guard Eugene Jeter (180-83, college: Portland) added 23 points, 14 rebounds, 7 assists and 4 steals respectively for Sturgeons in the defeat. Five Sturgeons players scored in double figures. Both coaches tested many bench players and allowed the starting five to rest. 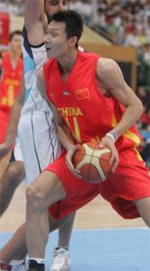 Xinjiang upset Guangsha in the first game of the series. Xinjiang Flying Tige made 25-of-33 free shots (75.8 percent) during the game, while Zhejiang Guangsha Lions only scored seven points from the stripe. They outrebounded Zhejiang Guangsha Lions 42-28 including a 32-21 advantage in defensive rebounds. Xinjiang Flying Tige shot the lights out from three sinking 17 long-distance shots on high 53.1 percentage. They looked well-organized offensively handing out 21 assists. American forward Jarnell Stokes (201-94, college: Tennessee) fired a double-double by scoring 31 points, 12 rebounds and 5 assists (on 10-of-13 shooting from the field) for the winners. International Abudushalamu Abudurexiti (203-96) chipped in 33 points (!!!) and 8 rebounds (on 12-of-14 shooting from the field). American point guard Courtney Fortson (180-88, college: Arkansas) produced a double-double by scoring 18 points and 10 assists and Greek center Ioannis Bourousis (214-83) added 17 points and 4 assists respectively for lost side. Four Xinjiang Flying Tige and five Zhejiang Guangsha Lions players scored in double figures. The winner was already known earlier in the game, so both coaches allowed to play the bench players saving starting five for next games.